Redhill, Warwick, Leamington & Harrogate | Rocket Steps. The art of communication. Day 16 – Redhill, Surrey. 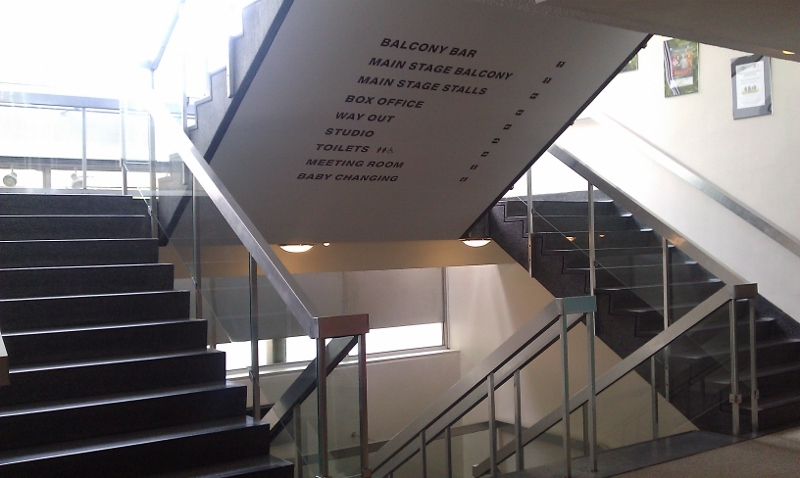 Redhill Harlequin is the first ‘stage-less’ venue we’ve done. I’m sure there is a technical term for it, but don’t know what it is. In the gusthouse, Richard and I are booked into a family room, with is spacous, and also has a shower cubicle in the corner. Despite being a bit ripe and fragrant with all the travelling I opt not to wash in full view. The crowd for that night is pretty broad and sporadic, a gang of sassy geek girls on one side and more considered older groups on the other side of a wide auditorium, make the show feel more like a gag tennis. There is a nice windmill on a hill on the way out, and I annoy a motorist by stopping to photograph it. Day 17 – Leamington Spa. On the way to ‘Royal Leamington Spa’, Hey Hey It’s…I spot the Monkee-mobile being karted up the motorway – a big red convertible with yellow lettering. I guess correctly it’s on it’s way to Manchester for the concert my missus is attending that night..here they come. We stop off in Warwick to look at the castle, but think better of it when we see the admission price of twenty quid. To be honest it looks more like an amusement park than a castle, which is fine for a family day out but not for a bunch of travellers looking for a quick fix of history. Instead we check out the town, and stumble across a town criers competition, which I consider to be all kinds of awesome as mature men and women are dressed up to the nines in all kinds of old school bling compete in the town square with their best five. ‘Workshopping’ in public as Danny Pensive, I talk to a lovely chap who is only too happy to chat, get my photo taken with him and show me his bell. Tonight is the Royal Spa Centre, the show is great but our tour manager is a bit narked that they don’t lt her operate the lights, like the other 99.9% of places we’ve been at. I’m enamoured of the seventie’s build of the place and the wide san-serif font used throughout the building – I can’t place it, but it’s straight out of Gerry Anderson’s UFO. The guest house has wifi, and tonight I have a room to myself. I fall asleep watching ‘The Doctor’s wife’ twice. It’s mint. The second free day of the run, and the opportunity to wake up in my own bed. I had entered the Manchester 10k which takes place today, but that was a massive overreach of good intent. I’m in no state for it physically or mentally. Wading through crowds in the rain wearing just a cardigan, I don’t care, I meet the missus at the end of her run and a big hug. I could fall asleep in the street. Next morning is catching up on some much overdue admin, speak to agent, speak to Buxton fringe, speak to cat, hamster and fish, then off to Harrogate. 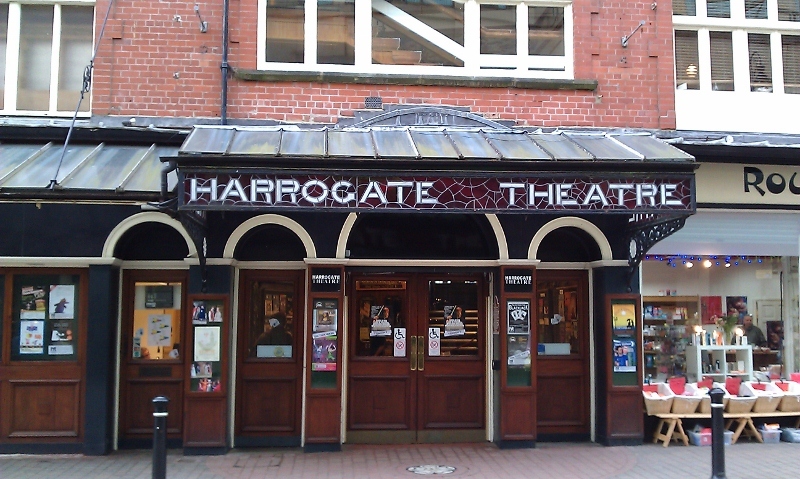 Harrogate theatre is a great venue, it shows a lot of comedy and it’s a cheap thrill to get recognised by the staff from and a the last time I was here. The main stage is a proper old theatre with a great atmosphere, and it’s a great warm show.